FeedForward Cinema is an exploratory non-narrative A/V project initiated by a Slovenian media artist and photographer, Luka Dekleva, in collaboration with a musician / media artist Luka Prinčič and composer/sound artist Miha Ciglar. In their performance the artists explore the infinite space created by the closed circuit of information, created by visual feedback of two video devices constantly feeding each other. One reads/creates the signal and the other presents it to the former one. Like with the microphony in sound, thus created loop becomes a new instrument of its own – a video device one can play (with). Because of the amplifying processing, induced by the identical loop visual effects emerge, results of the specific micro glitches rendered by the use of the related signals. What appears on the screen – the object of artist's manipulation – is actually a child of the typical distortions and noises. By using the successive amplification and applying (low and high pass) filters, an invisible, ever present flow of data reveals. The visual richness of the effects depends on the sort of equipment in use - the combination of the camera and the picture-presenting device (e.g. a cathode ray TV or an old projector). Each of the possible (analogue) display-camera pairs produces a specific set of micro noises and distortions - an ever different basis of artistic exploration. The result of the feed-back induced evolving abstract shapes seen on the screen function as an amplifier of the "organic" imperfection of the analogue electronic gadgets. Temporally strengthened particularity of the analog signal is the foundation for further digital processing and amplification of the signal. The result is permanently subject to the contingent micro unknowns, an inherent feature of all analogue electronic equipment, that make the end result an unrepeatable improvisation. Get the Flash Pla yer to see this player. It is the fragile balance of signals that makes the artistic exploration of the equipment's imperfections possible. This steady, but never static equilibrium can be reached by constant digital (auto)analysis of the presented picture. The "live" information on the brightness and the contrasts of the picture help the artists to direct the picture effects. Various digital effects and settings of digital processing are than applied by the artists. 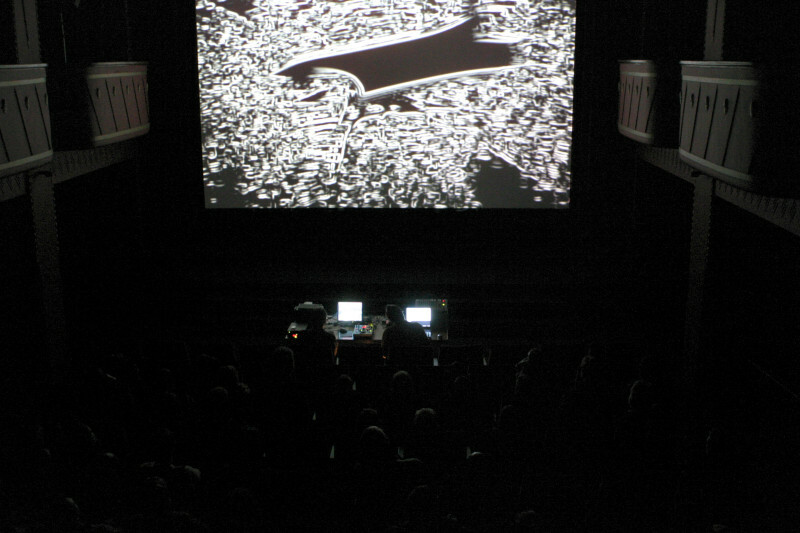 During the performance the computer analysis of the in-coming picture properties also start to manipulate various parameters of the self-generative audio fields. Naturally, the parameters of the musical composition can also start to interfere with video manipulation controls. Thus during the performance the control of the sound and video (self)generative abstractions gradually becomes completely intertwined.